Fun Fact: She needs a home with a family that likes to play— a big yard is preferred. Nyla is not shy anymore, she loves people and other dogs. Sometimes she gets a little aggressive with other doggies, so it would be better if she was in a home without other dogs, or maybe with just one. Nyla’s Story: Nyla came to us from our local pound, on her last day. She was adopted immediately, and was adorable with her giant ears. Nyla was loved and cared for by a wonderful lady, but became to big and too much for her to handle. 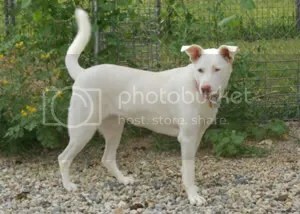 Nyla is very strong and loves to go for walks and enjoys running. She has free access to the farm, so gets plenty of exercise here. She has one eye outlined normal, and one outlined in pink. 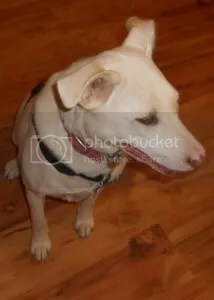 A beautiful gal—with creamy white coat and a unigue look. You have to ssee her and get to know her.